Most galaxies are dominated by dark matter. Our own galaxy is about 85% dark matter by mass. But recently a galaxy was discovered that is almost entirely dark matter. Known as Dragonfly 44, less than 0.01% of its mass is regular matter. Dark matter is highly mysterious due to the fact that we haven’t detected it directly. Since dark matter doesn’t interact with light, we can only observe its gravitational effect on light and the motions of stars. The elusive nature of dark matter has led some to propose other ideas such as modified gravity, but these don’t agree well with the Universe we observe. 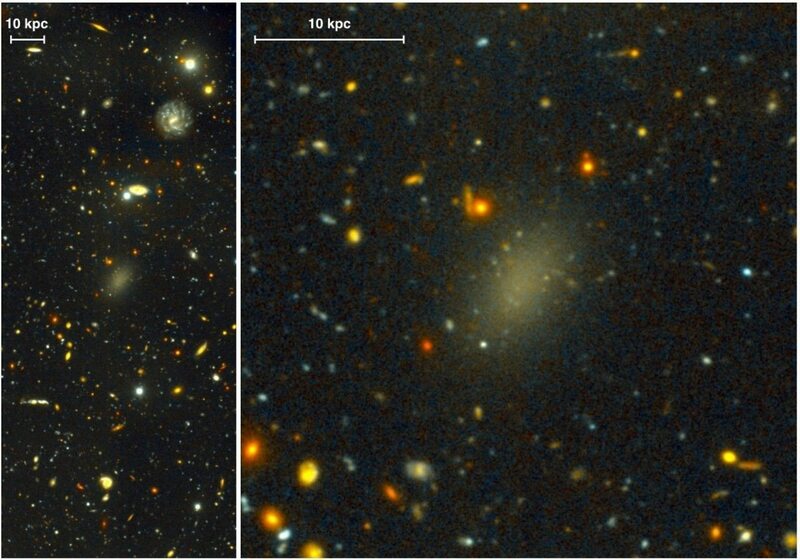 Given that dark matter is so mysterious, how do we know Dragonfly 44 is a dark matter galaxy? To begin with the galaxy is very diffuse. 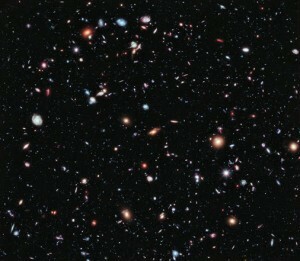 It is only slightly smaller than the Milky Way in size, but has about 1% the number of stars. 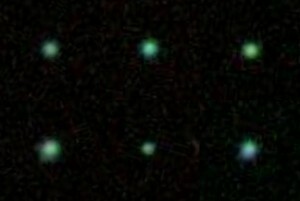 By itself that might not mean much, but Dragonfly 44 is part of a cluster of galaxies known as the Coma cluster. Over time such a diffuse galaxy would be torn apart by other nearby galaxies unless it had a large mass to hold it together. This is supported by the speeds of the stars within the galaxy. Stars within a galaxy generally orbit the center of a galaxy similar to the way planets orbit a star. The more mass a galaxy has, the faster the stars tend to orbit. By looking at the distribution of stellar speeds within a galaxy, we can get a measure of how much mass a galaxy has. Finally, Dragonfly 44 has about 100 globular clusters orbiting it. These are small but dense clusters of stars that generally form a kind of halo around larger galaxies. Typically, the larger the galaxy the more globular clusters it will have. All of this supports the idea that Dragonfly 44 has a mass about equal to that of our Milky Way. Given the low number of visible stars, that means 99.99% of its mass must be dark matter. The spectra of Dragonfly 44. Credit: P. van Dokkum, A. Romanowsky, J. Brodie. These kinds of Ultra Diffuse Galaxies (UDGs) could help us better understand dark matter. While galaxies such as the Milky Way are mostly composed of dark matter, their central regions where stars are most dense are dominated by regular matter. As a result it’s difficult to study the effects of dark matter in detail. With diffuse dark matter galaxies we can see the effects of dark matter more clearly. If dark matter does interact with itself to produce small amounts of light, as some have proposed, it might be visible within UDGs. If Dark Matter cannot be seen, then how can we be sure that Empty Space isn’t Dark Matter? Dark matter affects light gravitationally, so we can observe its effects. With the anticlimactic results from LUX and CDME, while everyone is saying that at least we have a better understanding of what DM isn’t, we actually seem further away from understanding what it is. Our best candidates keep falling by the wayside, and still all we know is that it is the apparent excess of gravity caused by a surplus of, well, nobody honestly has any idea. So, is there a point in the future, even near future, when we will have to go back to the chalkboard and take a hard look at the way we perceive the effects of gravity? “tak[ing] a hard look at the way we perceive the effects of gravity” is something that’s the subject of dozens, nay hundreds, of published papers. The ideas examined range from the wildest outreaches of theory, to the most prosaic of analyses of observations, and plenty of waystations between. I’m sure that hundreds, if not thousands, of young (and not so young) astronomers and physicists have a secret hope that it’ll be something they do which solves the mystery. How do the observations of Dragonfly 44 let us rule out the possibility of an unusually massive black hole at its center? Can we detect or infer the distribution of the unseen mass? If most of the mass were concentrated in a black hole at its center, the stellar motions would follow Kepler’s law, like the planets around our Sun. They don’t, and so we know the mass isn’t concentrated in the center. The authors conclusions don’t seem to follow from their findings and are contradicted by a large body of evidence from multiple independent sources but maybe you’re interested in having your take on it?